In an article I wrote a couple of years ago, I took a photograph of a snake near my shed, which was a freshwater snake [Tropidonophis mairii], sometimes called a keelback. A friend sent me two photos recently which were much better than mine! 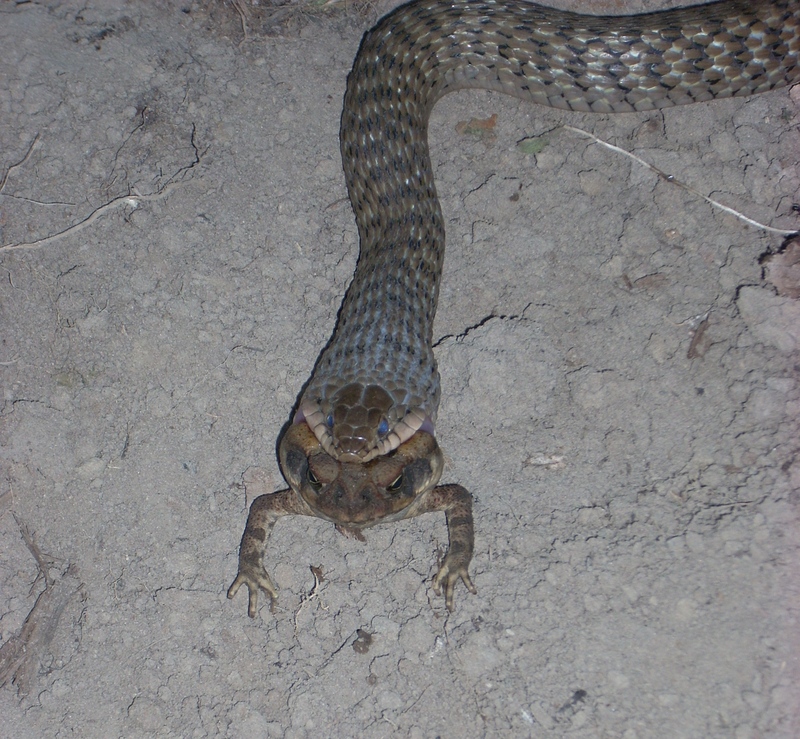 I mentioned initially that freshwater snakes seem to be able to eat cane toads [Bufo marinus] with impunity. These photos were taken in Mooloolah on the Sunshine Coast, next to a creek. My mate reckons this snake is a common visitor to his place. I had read that keelbacks can eat small toads and toad tadpoles without any problems, but this is the first time I have seen a toad this size being eaten. They are great shots and I thank Tim & Tash Odgers for letting me use them. The latest research suggests that rather than a learning behaviour this ability is more likely ancestral in origin… A report I read recently suggests that as the keelback has Asian ancestry, and in that environment bufonids [the true toad family, with over 200 species] are fairly common, it has adapted to be able to live with, and feed on them. Unfortunately most of our snakes do not posses this ability, and numbers of frog eating snakes are in decline. With the increase in toad numbers and range, this is not good for our ecology. Whilst many people have an aversion to snakes, they do play an important role in an ecosystem. So it looks like we still have a big problem with the toad, and that this snake will not become a natural bio-control agent just yet.